"Jodha-Akbar" redirects here. For the TV Series, see Jodha Akbar (TV series). 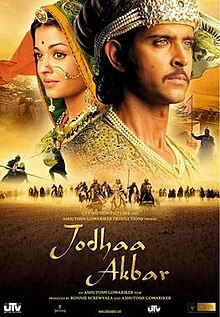 The film centres on the romance between the Mughal Emperor Jalal-ud-din Muhammad Akbar, played by Hrithik Roshan, and the Rajput Princess Jodhaa Bai who becomes his wife, played by Aishwarya Rai. Acclaimed composer A. R. Rahman composed the musical score. The soundtrack of the film was released on 19 January 2008. Upon release, it was a critical and commercial success. The film won the Audience Award for Best Foreign Language Film at the São Paulo International Film Festival, two awards at the Golden Minbar International Film Festival, seven Star Screen Awards and five Filmfare Awards, in addition to two nominations at the 3rd Asian Film Awards. Jodhaa, the daughter of King Bharmal of Amer, gets betrothed to another Rajput king and her dowry was her father's crown, which will pass to that Rajput king, after his death. Through this arrangement, the son of the elder brother of the king, Sujamal gets deprived of his rightful throne and he leaves the kingdom angrily to join rebels. When Mughal empire plans to attack Amer, King Bharmal resentfully makes a peace offering and a proposal to strengthen relations by his daughter's marriage to the emperor himself to avoid war. Akbar agrees to the marriage as it would bring forward a true strong alliance and long lasting peace between the empire and Rajputs. Jodhaa completely resented being reduced to a mere political pawn and she wants to marry the Rajput king she was betrothed to previously. She writes a letter to Sujamal, her cousin, entreating him to come rescue her from the marriage, but she doesn't send it, though. Jodhaa shares all her misery with her mother, who tells her to send a servant girl in her place. Jodhaa replies that it would deceive Akbar and would be death to their kingdom if he finds out. Then, her mother gives her a vial of poison and tells her to use it if a need arises. Jodhaa demands a meeting with Akbar and demands to not have her religion changed after marriage and that a temple be built for her to continue her faith, with the intention of having the emperor call off the wedding. To her surprise, Akbar agrees to all her demands. After their marriage, Jodhaa acts reluctant with Akbar and they do not consummate their marriage. He assures Jodhaa that they will let things fall into place. Over time both Jodhaa and Akbar learn from each other and gain admiration for their partners. Akbar's nurse and nanny, Maham Anga, who he considers like his own mother does not like Jodhaa and conspires to spoil her image in front of Akbar. She finds the letter Jodhaa had written and has it sent, but when Sujamal comes to meet Jodhaa in private, she instigates Akbar that Jodhaa went to meet her lover. Akbar sends his men to arrest Sujamal who thinks Jodhaa trapped him, and then banishes Jodhaa from the kingdom. Jodhaa too doesn't give an explanation, angry at her character being questioned. Later Akbar finds out the truth and goes to her maternal home to apologise and asks her to come back but she refuses. He also finds out that she is a skilled in sword fighting, and engages in a playful duel with Jodhaa, who after the duel tells him to introspect the working of his relations and kingdom. Akbar returns and travels through the common folk in disguise to understand the problems of his people better. Later Akbar controls the dissents among the Hindus and Muslims by announcing that every religion has its rights in his kingdom. This impresses Jodhaa who returns. Sujamal, Sharifuddin Hussain and his allies attack the kingdom. After Sujamal realises the past misunderstanding concerning the letter and dies just after apologising to Jodhaa. Akbar defeats Sharifuddin, and spares his life for his half-sister, Bakshi Banu Begum's sake, but not before stripping him of his title of Viceroy of Ajmer and Nagaur.Eventually Akbar proclaims that Hindustan will be a peaceful and prosperous land if people respect and honour each other's religions. The film ends as the narrator accounts that Jodhaa and Akbar created history through their unconditional and eternal love for each other. Ashutosh is the only director who could do justice to a film of such a level. In Lagaan, he touched on the issue of casteism, the oppressed class, Hindu-Muslim unity, communal harmony, team spirit, management and nationalism. He weaved all this beautifully to make a hit film without preaching or lecturing. In the same way, I told him he could make a beautiful film by touching on such issues without preaching. Gowariker had already finished his script for Swades (2004) when Ali pitched the idea. As a result, he decided to start his work with Ali after completing it. In December 2001, Ali began research on the marriage of princess Jodhabai, daughter of the Rajput ruler of Amer, Bharmal with the Mughal emperor Akbar, and prepared a basic story on the couple. One month after Swades was released, Ali met Gowariker and handed to him the story. Gowariker subsequently announced his next project, terming it "a romantic musical", titled Jodhaa Akbar. In March 2005, Gowariker started work on the screenplay with Ali while denying speculations that Firoz A. Nadiadwala and Subhash Ghai were producing the film. It was confirmed later in August 2006 that Gowariker would co-produce the film himself under his banner AGPPL productions with Ronnie Screwvala of UTV Motion Pictures, in addition to the latter distributing it. Ali and Gowariker completed the script in November 2005 and sought the help of Bhawani Singh, the Maharaja of Jaipur and his spouse, Maharani Padmini Devi to provide them with "creative inputs to make Jodhaa Akbar as realistic as possible. "[b] K. P. Saxena was hired to write the film's dialogues. Hrithik Roshan and Aishwarya Rai were the first choice of both Ali and Gowariker for portraying Akbar and Jodhabai respectively. Gowariker believed Roshan possessed the regal bearing and physique required to play the role of a king. According to Gowariker, Roshan immediately agreed after the former merely mentioned that he was doing a film on Akbar. Roshan learned Urdu as a means of preparing for his role. For casting Rai, Gowariker sent her a SMS asking "Will U B My Jodha?" to which Rai sent a reply stating "Yes, I will" followed by a smiley. Sonu Sood was chosen to play Jodhabai's brother Rajkumar Sujamal. Sood had rejected offers to feature in other projects as he wanted to fully involve himself in the film. The role of Akbar's mother, Hamida Banu Begum, was first offered to Saira Banu, who declined citing family commitments as her reason. The role subsequently went to Poonam Sinha which marked a comeback for her to acting since her brief stint in the 1970s. Actress and singer Ila Arun had wanted to work with Gowariker and approached him for a role in the film; Gowariker cast her as Akbar's nurse, Maham Anga. Nikitin Dheer was selected to play Sharifuddin Hussain, the rebellious brother-in-law of Akbar, after impressing Gowariker during the auditions. Kulbhushan Kharbanda portrayed Raja Bharmal while Suhasini Mulay was cast as Jodhabai's mother, Rani Padmavati. Actress Abir Abrar, niece of yesteryear actress Kumkum, was selected to play Bakshi Banu Begum, Akbar's sister and Hussain's wife. Indrajeet Sarkar was cast in the role of Birbal, but his scenes were cut from the film's final version to reduce its duration. A. R. Rahman, Javed Akhtar, Nitin Chandrakant Desai and Ballu Saluja were signed up as the music composer, lyricist for the songs, art director and editor respectively, thereby collaborating with Gowariker for the third time after Lagaan and Swades. Visual Computing Labs (VCL), a division of Tata Elxsi, were in charge of the film's special effects. Kiran Deohans, known for his work in Qayamat Se Qayamat Tak (1988), Aks (2001) and Kabhi Khushi Kabhie Gham... (2001), was the film's cinematographer. Gowariker chose Ravi Dewan to be the stunt co-ordinator for Jodhaa Akbar based on the latter's experience in handling historical films, such as 1942: A Love Story (1994). Chinni Prakash and his wife Rekha, Raju Khan and Ash Kumar were the film's choreographers. Neeta Lulla, who had earlier worked with Rai in Sanjay Leela Bhansali's Devdas (2002), was chosen to handle the film's costume designing. Lulla found Jodhaa Akbar to be "one of the most challenging films" she had done. This was because she had to design costumes not only for the lead actress, but for every cast member involved in the film. Lulla did extensive research for a year and a half on the type of clothes people wore during the Mughal Empire. She went to Jaipur to procure information on what type of fabrics were worn during that period. She schematically designed clothes by providing yellow, orange and red colours for the Rajputs and gold, brown and beige colours for the Mughals. Keeping in mind the grandeur of the Mughal Empire during Akbar's time, Lulla used the Zardozi and Kundan types of embroidery for Roshan's and Rai's dresses. The fabrics for designing the costumes as well as the shoes were bought from Delhi, Mumbai and Jaipur, while authentic embroidered Mojaris were used for footwear. Lulla designed clothes of dark brown, black and green colours for the character of Sharifuddin Hussain after taking the characters' persona into consideration. The jewellery used for the costumes were purchased from the jewellery brand company Tanishq. Jodhaa Akbar marked the company's second venture into films after the fantasy film Paheli (2005). A team of 200 craftsmen worked for 600 days to fashion and mould jewels made of gold gemstones. Around 300 kilograms of jewels were used. Rai and Roshan wore thirteen and eight sets of jewels respectively throughout the film. The set, which Aishwarya wore in the scene where Jodhabai is wedded to Akbar weighed 3.5 kilograms. Rai later mentioned in subsequent interviews that the toughest part of playing her character was to wear the jewellery as she found them quite heavy to bedeck. The jewels were designed using miniature paintings from Mughal literature and Akbar's autobiography by Abu'l-Fazl ibn Mubarak, the Akbarnama as influences. The scabbards used by the lead actors in the film weighed two kilograms. Filming commenced in early November 2006 at Jaipur with the climax sequence with Roshan and Dheer, and the First Battle of Panipat. Palace scenes featuring Rai as Jodhaabai before her marriage to Akbar were filmed at the Roopangarh Fort in Kishangarh. The sequence featuring the Battle of Panipat was shot in the Dhula region located on the outskirts of Jaipur. To prepare for their fight sequences, Roshan and Rai learnt sword-fighting and horse-riding a month before filming began at Mehboob Studio and Mahalaxmi Racecourse respectively. Rai had learnt sword-fighting and horse-riding while filming The Last Legion (2007) because of which she had little difficulty in her preparations. Dewan worked with Desai in designing the armour and ammunitions. The cannons were made of carbon fibre with iron inserted on the inner portions to make sure the cannonballs were fired smoothly. The swords were initially made of both wood and fibre but were later made of lightweight carbon fibre due to the actors not being able to manoeuvre them easily. All of the stunt sequences were rehearsed everyday from 3 am to 7 am before they were filmed. A team of 250 stuntmen and 5,000 extras were used for all the battle scenes, which were filmed for 20-30 days at a stretch. Ashutosh wanted the climax to be perfect because of which the extras, who were people from nearby villages and were used for Akbar's and Hussain's armies, would often get tired standing in the same position for an entire day. Some of them would not be present the next day. As a result, Dewan placed the 250 stuntmen in the front rows of both armies so as not to show how exhausted the villagers were. Deohans employed six cameras to film the climax scene from different angles. He was influenced by films such as Gladiator (2000) and Troy (2004) as he found the "basic colour" of those films' locations similar to that of Rajasthan's arid surroundings. The lighting was used depending on the scenes filmed. Further shooting took place at Sambhar Lake Town, and the forts of Amber, Amer and Agra. The scene where Akbar prays to the Islamic scholar Moinuddin Chishti for a successful conquest of India was filmed at the Ajmer Sharif Dargah. After the completion of the first schedule of filming—which took in 60 days—by the end of December 2006, the second schedule began on 8 January 2007 at Desai's ND Studios based in Karjat. Desai took "lakhs of photographs" of Amer Fort and Agra fort. Using the photos as reference, he erected sets consisting of the inner portions of both places in his studio. Filming could not take place entirely at the forts due to heavy traffic of tourists coming there everyday. Consequentially, only the outer portions of both the forts were filmed on the spot during the first schedule while the scenes featuring the inner portions were filmed at Karjat. The inner portions that were erected by Desai included the Dīwān-e-Ām, Dīwān-e-Khās, Jodhaabai's inner chambers and the fort's gardens. The entire set measured 1,600 feet long, 600 feet wide and 68 feet high, which according to Desai was equivalent to "seven floors of a high-rise". Concrete, fibre and asbestos sheets were the materials used to create the interiors of the forts. The cost of the entire set at Karjat was estimated to be around ₹120 million. The song "Azeem-O-Shaan Shahenshah", which was choreographed by Prakash, featured about 12 assistant choreographers, 400 dancers and 2,000 extras acting as the citizens of Agra. Prakash used the dance steps featured in the songs of films such as Ganga Jamuna (1961) and Guide (1965) as reference. The song was planned to be finished within 10 days but took 15 days to complete as Prakash felt it was "difficult to stick to a deadline when you have a crowd this big." He credited his team for finishing the song as he believed it would have taken "a month" to film without their co-operation. The music video for "Azeem-O-Shaan Shahenshah" had a production cost of ₹25 million ($575,000). It was the most expensive Bollywood music video at the time, matching "Dola Re Dola" from Devdas (2002). A total of 80 elephants, 100 horses and 55 camels were employed throughout the entire film. The battle scene featuring Roshan and Ulhas Barve, who plays the King of Mankeshwar, Chittorgarh district, was filmed in June 2007 at Jaipur. Shooting was completed in October–November 2007 at Karjat. Due to the amount of money spent on the costumes and sets, the budget of the film, which was initially ₹370 million, increased to ₹400 million. Many of the events portrayed in the movie are based on real events. Certain Rajput groups claimed Jodhaa was married to Akbar's son, Jahangir, not Akbar. Several historians claim that Akbar's Rajput wife was never known as "Jodhaa Bai" during the Mughal period. According to Professor Shirin Moosvi, a historian of Aligarh Muslim University, neither the Akbarnama (a biography of Akbar commissioned by Akbar himself), nor any historical text from the period refer to her as Jodhaa Bai. Moosvi notes that the name "Jodhaa Bai" was first used to refer to Akbar's wife in the 18th and 19th centuries in historical writings. In Tuzk-e-Jahangiri, she is referred to as Mariam-uz-Zamani. According to historian Imtiaz Ahmad, the director of the Khuda Baksh Oriental Public Library in Patna, the name "Jodhaa" was used for Akbar's wife for the first time by Lieutenant-Colonel James Tod, in his book Annals and Antiquities of Rajasthan. According to Ahmad, Tod was not a professional historian. N. R. Farooqi claims that Jodhaa Bai was not the name of Akbar's Rajput queen; it was the name of Jahangir's Rajput wife. The portrayal of ethnic Rajput people in the movie was criticised by members of the Rajput community as misleading, politically motivated historical revisionism that minimised Rajput history. The community's protests against the film in some states led to the film being banned in the states of Uttar Pradesh, Rajasthan, Haryana and Uttarakhand. However, the producer went to the Supreme Court to challenge it. Later, the Supreme Court of India lifted the ban on screening the film in Uttar Pradesh and some towns of Uttarakhand and Haryana. The court scrapped the Uttar Pradesh government ban as well as similar orders by authorities in Dehradun, Uttarakhand and Ambala, Sonepat and Rewari, Haryana. Rotten Tomatoes has given the film a 79% rating, with 11 fresh and 3 rotten reviews. The film received a critics' rating of 69 on Metacritic based on 4 reviews. Anil Sinanan of The Times gave the film four out of five stars, stating, "Oscar-nominated Lagaan director Ashutosh Gowariker's sumptuous period epic has all the ingredients of a Cecil B. DeMille entertainer [...] The film ends with a passionate plea for tolerance of all religions in India, a resonant message for modern India." Rajeev Masand of CNN-IBN also gave the film four out of five stars, commenting: "I've never felt this way about any other film, but sitting there in my seat watching Jodhaa Akbar, I felt privileged as a moviegoer. Privileged that such a film had been made, and privileged that it had been made in our times so we can form our own opinions of the film rather than adopt the opinions of previous generations, which we invariably must when looking at older classics." Tajpal Rathore of the BBC gave the film four out of five stars, noting that, "although the 16th-century love story upon which it's based might be long forgotten, this endearing treatment sears into the memory through sheer size and scale alone [...] Don't let the running time put you off watching this unashamedly epic tale." Nikhat Kazmi of The Times of India gave the film three stars, stating that, "Jodhaa Akbar works only because its heart is in the right place. The film talks about a love that transcends all barriers – gender, religion, culture – and dreams of an India where secularism and tolerance are the twin towers that should never ever crumble. And Akbar and Jodhaa are the alluring exponents of this dream." Kazmi also suggests that "if you are willing to shed off all the trappings of history, only then will Jodhaa Akbar work for you." While suggesting that the film is "too long" and that it is "not a history lesson," Rachel Saltz of The New York Times also notes, "in choosing to tell the tale of this emperor and a Muslim-Hindu love story, Mr. Gowariker makes a clear point. As Akbar says, 'Respect for each other's religion will enrich Hindustan.'" Jodhaa Akbar collected a gross revenue of ₹77.85 crore (US$20.82 million) in India. Box Office India declared it a semi-hit at the domestic box office. Its domestic net income was ₹56.04 crore, equivalent to ₹86.28 crore (US$12 million) adjusted for inflation. Overseas, it grossed US$7.55 million (₹49.92 crore), and was declared a blockbuster at the overseas box office. Its overseas gross included US$2.1 million in the United Kingdom, US$3.45 million in North America, US$450,000 in Australia, and US$1.1 million in the Arab States of the Persian Gulf region. The film ended its box office run with a worldwide lifetime gross of ₹112 crore (equivalent to ₹233 crore or US$32 million in 2018), equivalent to US$28.37 million at the time. The acclaimed score and soundtrack of the film was composed by A. R. Rahman, making his third collaboration with Ashutosh Gowariker after Lagaan, and Swades. The official soundtrack contains five songs and two instrumentals. Rahman scored the prewritten lyrics by Javed Akhtar, except for the songs "Khwaja Mere Khwaja" and "Azeem-O-Shaan Shahenshah". The former was written by Kashif while the latter was by Javed Akthar himself. The music was released on 9 January 2008 and the CDs were out by 18 January. The soundtrack album was met with very positive reviews, with most of the reviewers hailing the album a magnum opus by Rahman. Aakash Gandhi of Planet Bollywood reviewed the album, saying, "Jodhaa Akbar compositions are magical, spectacular, invigorating and above all a wholesome experience you rarely get in soundtracks these days. When you cannot pick a favourite you know the benchmark has been set consistently high. Indian music has just added another soundtrack to its eternal treasure." According to the Indian trade website Box Office India, with around 11,00,000 units sold, this film's soundtrack album was the year's fourteenth highest-selling. The film emerged out as the biggest winner in many music awards. However, in the best music direction category, it lost many mainly to Jaane Tu... Ya Jaane Na, composed by Rahman himself. The fine background score won the film many awards including Filmfare Best Background Score and IIFA Best Background Score. The soundtrack was also nominated in numerous categories. Song of the Year – "Jashn-E-Bahara"
Male Vocalist of the Year – Javed Ali for "Jashn-E-Bahara"
Female Vocalist of the Year – Bela Shende for "Man Mohana"
Lyricist of the Year – Javed Akhtar for "Jashn-E-Bahara"
Technical Award For Programming and Arranging – TR Krishna Chetan for "Jashn-E-Bahara"
Star Screen Award for Best Choreographer – Raju Khan for "Khwaja Mere Khwaja"
IIFA Best Male Playback Award – Javed Ali for "Jashn-e-Bahara"
Best Choreographer – Raju Khan for "Khwaja Mere Khwaja"
Best Lyrics – Kashif for "Khwaja Mere Khwaja"
Best Male Playback Singer – A. R. Rahman for "Khwaja Mere Khwaja"
^ Haidar Ali had acted with Gowariker in Saeed Akhtar Mirza's 1989 drama film, Salim Langde Pe Mat Ro. ^ In a rather contrariwise interview with Sudipta Datta of The Financial Express, Gowariker says that it took him "two and a half years to script". This was because he changed it continuously so as to accommodate production demands and constraints. ^ "Jodhaa Akbar could make even more money than OSO". Rediff. 19 February 2008. ^ a b "Top Worldwide Grossers ALL TIME: 37 Films Hit 100 Crore". Box Office India. Archived from the original on 30 October 2013. Retrieved 1 February 2014. ^ "25 January 2008". IndiaFM. 12 September 2007. Retrieved 9 January 2008. ^ "Aishwarya gets summons by Customs Department". IndiaFM. 15 November 2006. Retrieved 3 October 2007. ^ "Jodhaa Akbar Synopsis". apunkachoice.com. Archived from the original on 5 February 2015. Retrieved 4 February 2015. ^ a b "Jodhaa Akbar wins Audience Award at Sao Paulo International Film Fest". Business of Cinema. 3 November 2008. Archived from the original on 14 February 2009. Retrieved 31 January 2009. ^ a b "Jodhaa Akbar, Hrithik win awards at Golden Minbar Film Festival in Russia". Bollywood Hungama. 23 October 2008. Archived from the original on 8 July 2011. Retrieved 31 January 2009. ^ "Awards for Jodhaa Akbar (2008)". Internet Movie Database. Retrieved 31 January 2009. ^ Firdaus Ashraf, Syed (22 January 2008). "The inspiration behind Jodhaa Akbar — Slide 2a". Rediff.com. Archived from the original on 8 December 2016. Retrieved 8 December 2016. ^ a b Firdaus Ashraf, Syed (22 January 2008). "The inspiration behind Jodhaa Akbar — Slide 1". Rediff.com. Archived from the original on 8 December 2016. Retrieved 8 December 2016. ^ "I am showing Akbar's formative years: Gowariker". Sify. Indo-Asian News Service. 27 January 2008. Archived from the original on 21 December 2016. Retrieved 21 December 2016. ^ a b Firdaus Ashraf, Syed (22 January 2008). "The inspiration behind Jodhaa Akbar — Slide 2". Rediff.com. Archived from the original on 8 December 2016. Retrieved 8 December 2016. ^ K. Jha, Subhash (12 February 2005). "Ashutosh Gowariker to make a historical". Sify. Archived from the original on 8 December 2016. Retrieved 8 December 2016. ^ Adarsh, Taran (29 March 2005). "'Akbar-Jodha': Ashu reveals plans". Sify. Archived from the original on 8 December 2016. Retrieved 8 December 2016. ^ Adarsh, Taran (14 June 2005). "Ashu — Ghai join hands?". Sify. Archived from the original on 8 December 2016. Retrieved 8 December 2016. ^ "UTV to co-produce Akbar-Jodha with Ashutosh Gowariker". Bollywood Hungama. 10 August 2006. Archived from the original on 11 December 2016. Retrieved 11 December 2016. ^ M. Shah, Kunal (22 January 2008). "Beauty, Queen". Mumbai Mirror. Archived from the original on 10 December 2016. Retrieved 9 December 2016. ^ Datta, Sudipta (3 February 2008). "If the story is engaging, it can appeal to people across time zones". The Financial Express. Archived from the original on 9 December 2016. Retrieved 9 December 2016. ^ "And now its Hrithik's turn!". Bollywood Hungama. 16 July 2005. Archived from the original on 9 December 2016. Retrieved 9 December 2016. ^ J. Pais, Arthur (29 January 2008). "'Hrithik and Aishwarya are the reincarnation of Akbar and Jodhaa' — Slide 1". Rediff.com. Archived from the original on 9 December 2016. Retrieved 9 December 2016. ^ "Will U B My Jodha?". Sify. 14 July 2005. Archived from the original on 9 December 2016. Retrieved 9 December 2016. ^ N, Patcy; Firdaus Ashraf, Syed (13 February 2008). "Who's who in Jodhaa Akbar — Slide 2". Rediff.com. Archived from the original on 9 December 2016. Retrieved 9 December 2016. ^ Kotwani, Hiren (3 September 2007). "Sonu Sood's happy to work with Hrithik, Ash in Jodhaa Akbar". Hindustan Times. Archived from the original on 9 December 2016. Retrieved 9 December 2016. ^ Venkatesh, Jyothi (12 April 2007). "I do not want to seek glory, says Saira Banu". Daily News and Analysis. Retrieved 9 December 2016. ^ N, Patcy; Firdaus Ashraf, Syed (13 February 2008). "Who's who in Jodhaa Akbar — Slide 3". Rediff.com. Archived from the original on 9 December 2016. Retrieved 9 December 2016. ^ Jha, Giridhar (26 April 2009). "Bahu's charm vs Patna boy". India Today. Archived from the original on 9 December 2016. Retrieved 9 December 2016. ^ N, Patcy; Firdaus Ashraf, Syed (13 February 2008). "Who's who in Jodhaa Akbar — Slide 4". Rediff.com. Archived from the original on 9 December 2016. Retrieved 9 December 2016. ^ N, Patcy; Firdaus Ashraf, Syed (13 February 2008). "Who's who in Jodhaa Akbar — Slide 1". Rediff.com. Archived from the original on 9 December 2016. Retrieved 9 December 2016. ^ "Jodhaa Akbar — Cast". The New York Times. Archived from the original on 13 March 2008. Retrieved 10 December 2016. ^ "'I'm not worried about getting stereotyped'". The Times of India. 10 March 2008. Archived from the original on 10 December 2016. Retrieved 10 December 2016. ^ "Gowariker Edited Birbal From 'Jodhaa Akbar'". Daily News and Analysis. Press Trust of India. 3 June 2008. Archived from the original on 16 December 2016. Retrieved 16 December 2016. ^ Devi Dundoo, Sangeetha (24 January 2009). "Game, set, movie". The Hindu. Archived from the original on 10 December 2016. Retrieved 10 December 2016. ^ Verma, Sukanya (22 January 2008). "Jodhaa Akbar's music: A musical conquest". Rediff.com. Archived from the original on 10 December 2016. Retrieved 10 December 2016. ^ "Tata Elxsi's Visual Computing Labs renders astounding visual effects for the epical romance Jodhaa Akbar". Tata Group. 28 February 2008. Archived from the original on 10 December 2016. Retrieved 10 December 2016. ^ N, Patcy (11 February 2008). "Making Jodhaa Akbar visually stunning — Slide 1". Rediff.com. Archived from the original on 10 July 2016. Retrieved 11 December 2016. ^ a b N, Patcy (31 January 2008). "Teaching Hrithik & Ash how to fight — Slide 1". Rediff.com. Archived from the original on 11 December 2016. Retrieved 11 December 2016. ^ N, Patcy (4 February 2008). "Making Jodhaa-Akbar dance — Slide 4". Rediff.com. Archived from the original on 18 December 2016. Retrieved 18 December 2016. ^ a b c N, Patcy (12 February 2008). "Dressing up Jodha and Akbar — Slide 1". Rediff.com. Archived from the original on 11 December 2016. Retrieved 11 December 2016. ^ Jhala, Angma Dey (6 October 2015). Royal Patronage, Power and Aesthetics in Princely India. Routledge. p. 168. ISBN 978-1-3173-1656-5. ^ N, Patcy (12 February 2008). "Dressing up Jodha and Akbar — Slide 4". Rediff.com. Archived from the original on 11 December 2016. Retrieved 11 December 2016. ^ N, Patcy (12 February 2008). "Dressing up Jodha and Akbar — Slide 2". Rediff.com. Archived from the original on 11 December 2016. Retrieved 11 December 2016. ^ a b c "'Ash, Hrithik wore 300 kg of gold in Jodhaa-Akbar'". Sify. Indo-Asian News Service. 23 January 2008. Archived from the original on 28 November 2017. Retrieved 13 December 2016. ^ "Now, Jodhaa Akbar jewellery". The Hindu. 9 March 2008. Archived from the original on 14 December 2016. Retrieved 14 December 2016. ^ Bhat, Divya (20 June 2008). "Now, Jodhaa Akbar jewellery". The Hindu. Archived from the original on 7 February 2013. Retrieved 15 December 2016. ^ "Buzzzzz — Jodha Akbar fracas". The Telegraph. 12 November 2006. Archived from the original on 15 December 2016. Retrieved 15 December 2016. ^ Ayaz, Shaikh (5 October 2006). "Ashutosh nabs the baddie". Daily News and Analysis. Archived from the original on 16 December 2016. Retrieved 16 December 2016. ^ "I too want to know who sent the parcel to me: Ash". Sify. Press Trust of India. 21 November 2006. Archived from the original on 18 December 2016. Retrieved 18 December 2016. ^ "Ashutosh: I didn't faint on the sets of Jodha Akbar". Sify. 1 December 2006. Archived from the original on 18 December 2016. Retrieved 18 December 2016. ^ Ayaz, Shaikh (17 October 2006). "Hrithik takes up sword-fighting". Daily News and Analysis. Archived from the original on 16 December 2016. Retrieved 16 December 2016. ^ a b c N, Patcy (31 January 2008). "Teaching Hrithik & Ash how to fight — Slide 3". Rediff.com. Archived from the original on 17 December 2016. Retrieved 17 December 2016. ^ Ashraf, Syed Firdaus (1 November 2006). "'When I get married, you'll know' - Slide 6". Rediff.com. Archived from the original on 16 December 2016. Retrieved 16 December 2016. ^ N, Patcy (31 January 2008). "Teaching Hrithik & Ash how to fight — Slide 5". Rediff.com. Archived from the original on 17 December 2016. Retrieved 17 December 2016. ^ N, Patcy (31 January 2008). "Teaching Hrithik & Ash how to fight — Slide 4". Rediff.com. Archived from the original on 17 December 2016. Retrieved 17 December 2016. ^ N, Patcy (11 February 2008). "Making Jodhaa Akbar visually stunning — Slide 3". Rediff.com. Archived from the original on 18 December 2016. Retrieved 18 December 2016. ^ N, Patcy (11 February 2008). "Making Jodhaa Akbar visually stunning — Slide 4". Rediff.com. Archived from the original on 18 December 2016. Retrieved 18 December 2016. ^ N, Patcy (11 February 2008). "Making Jodhaa Akbar visually stunning — Slide 5". Rediff.com. Archived from the original on 21 December 2016. Retrieved 21 December 2016. ^ "In the footsteps of the stars — Royal Rajasthan". Rediff.com. 26 March 2009. Archived from the original on 20 December 2016. Retrieved 20 December 2016. ^ "Weather the desert storm". The Telegraph. 9 January 2007. Archived from the original on 17 December 2016. Retrieved 17 December 2016. ^ a b Kumar, Anuj (8 February 2008). "Epic Scale". The Hindu. Archived from the original on 21 December 2016. Retrieved 21 December 2016. ^ a b Sinhal, Meenkashi (9 December 2007). "Grand sets add to movie grandeur". The Times of India. Archived from the original on 20 December 2016. Retrieved 20 December 2016. ^ Jamkhandikar, Shilpa (16 January 2008). "An Earthquake Proof Set Worth Rs 12 Crore!". Daily News and Analysis. Archived from the original on 21 December 2016. Retrieved 21 December 2016. ^ N, Patcy (4 February 2008). "Making Jodhaa-Akbar dance — Slide 4". Rediff.com. Archived from the original on 21 December 2016. Retrieved 21 December 2016. ^ N, Patcy (4 February 2008). "Making Jodhaa-Akbar dance — Slide 3". Rediff.com. Archived from the original on 21 December 2016. Retrieved 21 December 2016. ^ N, Patcy (4 February 2008). "Making Jodhaa-Akbar dance — Slide 6". Rediff.com. Archived from the original on 21 December 2016. Retrieved 21 December 2016. ^ a b "Here Are The 12 Most Expensive Songs Ever Made In Bollywood". UC News. 19 May 2018. ^ "Official exchange rate (LCU per US$, period average)". World Bank. 2008. Retrieved 13 December 2018. ^ Chatterji, Shoma A. (3 February 2008). "Past forward". The Tribune. Archived from the original on 21 December 2016. Retrieved 21 December 2016. ^ ""Jodha Akbar" nears completion". Mid Day. 16 July 2007. Archived from the original on 21 December 2016. Retrieved 21 December 2016. ^ "Aishwarya Rai celebrates 'special birthday' in Agra". Daily News and Analysis. Indo-Asian News Service. 1 November 2007. Archived from the original on 27 December 2016. Retrieved 27 December 2016. ^ Gangal, Ashwini (23 December 2007). "Interview of Haider Ali: The master-mind behind Jodhaa Akbar". Mumbai Mirror. Archived from the original on 24 June 2013. Retrieved 27 December 2016. ^ Lakshman, Nikhil (12 February 2008). "'Working with Hrithik and Aishwarya was terrific' — Slide 6". Rediff.com. Archived from the original on 21 December 2016. Retrieved 21 December 2016. ^ "Jodhaa Akbar :: Official Website". Jodhaaakbar.com. Retrieved 27 October 2008. ^ "Jodhaa Akbar not being screened in Rajasthan". IndiaFM. 16 February 2008. Archived from the original on 2 March 2008. Retrieved 20 February 2008. ^ a b c Ashley D'Mello (10 December 2005). "Fact, myth blend in re-look at Akbar-Jodha Bai". The Times of India. Archived from the original on 8 December 2012. Retrieved 15 February 2008. ^ Syed Firdaus Ashraf (5 February 2008). "Did Jodhabai really exist?". Rediff.com. Retrieved 15 February 2008. ^ Atul Sethi (24 June 2007). "'Trade, not invasion brought Islam to India'". The Times of India. Retrieved 15 February 2008. ^ "Rajputs' reasons behind preventing screening of Jodhaa Akbar in Rajasthan and elsewhere". Ibosnetwork.com. 11 February 2008. Retrieved 1 July 2011. ^ "UP bans screening of Jodhaa Akbar". NDTV. 2 March 2008. Archived from the original on 8 March 2008. Retrieved 2 March 2008. ^ "Court moved against banning the film". The Hindu. 2 March 2008. Retrieved 2 March 2008. ^ "Supreme Court lifts ban on Jodhaa Akbar, for now". Reuters. 3 March 2008. Retrieved 4 March 2008. ^ "Jodhaa Akbar @ Rotten Tomatoes". Rotten Tomatoes. Retrieved 1 July 2011. ^ "Jodhaa Akbar". Metacritic. Retrieved 1 July 2011. ^ "Masand's Verdict: Jodhaa Akbar". Ibnlive.in.com. Retrieved 1 July 2011. ^ Tajpal Rathore Updated 11 February 2008 (11 February 2008). "Jodhaa Akbar". BBC Jews. Retrieved 1 July 2011. ^ Nikhat Kazmi (15 February 2008). "Jodhaa Akbar". The Times of India. Retrieved 1 July 2011. ^ Rachel Saltz (16 February 2008). "A Muslim and a Hindu. Let's Dance". The New York Times. Retrieved 27 October 2008. ^ a b c "Jodhaa Akbar". Box Office India. Retrieved 7 November 2017. ^ "Music review: Jodhaa Akbar". Rediff.com. Retrieved 1 July 2011. ^ a b Aakash Gandhi (2009). "Jodhaa Akbar Music Review". Planet Bollywood. ^ "Jodha Akbar Songs - Jodha Akbar Tamil Movie Songs - Tamil Songs Lyrics Trailer Videos, Preview Stills Reviews". Raaga.com. Archived from the original on 20 February 2014. Retrieved 6 August 2014. ^ "Winners of Max Stardust Awards 2009". Bollywoodhungama.com. 16 February 2009. Archived from the original on 6 September 2011. Retrieved 1 July 2011. ^ "Aamir Khan's TZP wins V Shantaram Gold Award; A Wednesday wins silver". Indiantelevision.com. 29 December 2008. Retrieved 1 July 2011.